Hypocrisy is that kind of band that even if you are not in to the kind of music they do, you have at least heard of the once. Doing some awesome music since the last century, they released their newest work just a few weeks ago. And what a release! If you were expecting hearing some of their characteristic sci-fi themes, you are in for a surprise… sort of. The album starts up with rather epic sounding melodics. A prelude for some alien experimenting tune? Nope. The album has a consistent theme regarding social issues. For the first four songs and then the seventh we hear a harsh but dead-on critique to social repression by media and wealth, greed, a bit of capitalism, war and some world wealth distribution. It is like a call for revolution, The Eye (third song) being my favourite - rhythm, melody and theme wise. On the other songs we can find some early Hypocrisy themes: genocide, nightmares, death, hell and demons populate the themes of the songs. In Hell is Where I Stay (sixth song of the album) the lyrics go on about how the protagonist lives in hell, comes for your soul, makes Jesus weep, yet don’t ever explicitly mention being a demon or Satan.., Super smooth! In a different note, in 44 Double Zero (track five) I found a rather Balls to the Wall sound on the bridge and pre-chorus. Going back to what’s important, if it wasn’t for The Return (Ninth and last song of the album), I’d say songs five, six and eight are just floating there disconnected, but said song comes and ties together the social inequity mentioned constantly throughout the album with that fantasy element of the songs. Starting up with a super soft, melodic intro that then turns heavy (which reminds me to Insomnium’s Equivalence album), the song is the epitome of the whole albums thematic. Takes that inequity message and blends it together with the magic flying demons thing, culminating a call for revolution and change. 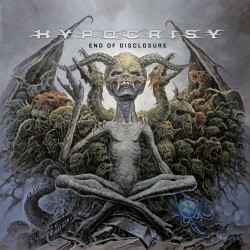 This album is highly recommended both to old Hypocrisy fans and new listeners.